I'm sure many people have heard about the communication between a Delta flight 2244 and Atlanta tower being on news today. When the Controller informs the Pilot he is on a wrong taxi-way, things get a little heated up. Regardless of who was right who was wrong, there were many lives involved (i'm sure they were not put in danger) but then who takes precedence in such a situation? Can the controller tell the aircraft to stop dead in its tracks or turn back to the hangar for violating his instructions because there are other planes coming in to land and this can become a little dangerous? Note: I am fully aware that no one was close to danger and lives were not at risk, but still pilot did worry that there is another plane coming down. We'll taxi out there any way we want when you tell us to. Please note that this reporting on that article is misleading. It is about taxi clearance and not landing on a wrong runway, However I have no control of what reporters write in their articles. The transcript itself is clear. It isn't a black and white issue of who has higher authority. A pilot in command (PIC) is the ultimate authority for the safe operation of his airplane. An air traffic controller is the authority for the block of airspace or pavement he controls. When you are operating under ATC, it is your responsibility to comply with their instructions as long as they fall within the regulations, they are safe and you are able to comply, If ATC issues an instruction contrary to regulation or something that would compromise safety, that is when you exercise your PIC authority to deviate from their instruction. If you are unable to comply, you exercise your authority to deviate and explain why you are deviating. When you cannot comply with an ATC instruction, for whatever reason, it is the job of ATC to accommodate your and move other airplanes out of your way. §91.123 Compliance with ATC clearances and instructions. Absent an emergency, an urgent need* or an inability to comply with ATC, a pilot is required to obey an ATC clearance. Given this relationship and its exceptions, its is hard to quantify who has a "higher" authority. Both are the ultimate authorities of their domains, but who overrules who is dependent on the situation. In general however, ATC will be issuing proper clearances that a pilot is bound by regulation to follow, though the pilot must exercise his authority to execute that instruction in a safe manner. *Urgent needs include things like TCAS RA events and things like weather deviations. In most cases ATC will help you out with a deviation, but if a controller refuses to allow a deviation, I would happily exercise my PIC authority to safely operate my airplane and turn left/right a few degrees rather than penetrate a thunderstorm updraft. DL2422 is at the southern exit of ramp 3 and requesting taxi with ATIS information Q. Ground: Delta 2422, behind the MD88 from your right, runway 27R, taxi via Mike and hold short of Dixie. 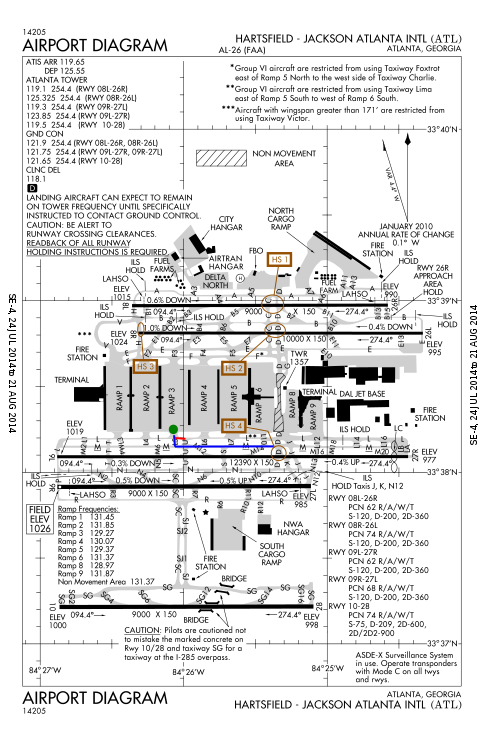 ATC has instructed DL2422 to let an MD88 pass from right to left, to taxi on taxiway M to runway 27R but to hold short for taxiway D (in ATL D is "Dixie" due to the larger number of "Delta" airplanes). To follow this instruction, an airplane should taxi south from spot 3S on taxiway L5, cross L and then turn left on M, then taxi on M, stopping short of D and awaiting further instruction. Here, DL2422 acknowledges this correctly. DL2422 has been issued a wheels-up time, but their taxi clearance has not been amended. They are still cleared to taxi via M short of D. Sequencing to meet this time will happen east of D in further clearances. DL2422: Yes sir, we're going out there right now. DL2422: You know what, we'll taxi out there any way we want unless you tell us to, I don't like your attitude. Ground: I don't have an attitude sir, I'm just saying it looks like you joined L instead of M and I'm just trying to correct you before you stay on L.
DL2422: Ok, cause my god, there's another plane out there, its like 6 miles away. Your attitude is really something sir, we're out here on M. Good morning. Ground: Good morning. There was no attitude, I was just trying to correct you, that's my job to correct you if you mess up. I'm just trying to make sure everyone is doing what I ask them for certain reasons. DL2422: You make a mistake every 2-3 minutes, but my attitude is not like yours, we're out on M and you didn't tell us how to get there so next time you can try doing that. The DL captain is making a scene and a very roundabout argument that the taxi route did not specify how he was supposed to transition from spot 3S to taxiway M. I agree that this is the case, but do not understand why any assumption would be made other than to taxi straight out and turn left on M.
This is a good example of a minor deviation that had DL2422 just turned right and then left and said "oops, fixing that, joining M, thanks! ", then that would have been the end of it. This captain's unprofessional display will instead net him disciplinary action and classify his deviation as "willful" rather than "accidental". In this image, the green circle is the starting point of DL2422 and the blue line is the cleared taxi route with the assumed transition to M via L5. The short red line is the initial taxi route DL2422 took. It is not clear where they transitioned to M, so I did not extend the red route past the first possible transition. There appears to be some controversy over the verbiage of "behind" used in the ATC taxi clearance. The only reference I can find to this word in a cursory search is in FAA order 7110.65 (ATC procedures) in section 3-7-2 that gives example taxi clearances. This does not define "behind" but does give distinct examples that clearly differentiate "behind" from "follow". Given that I cannot find a better reference, all I can offer instead is years of experience in a 121 cockpit based at busy airports like IAH and EWR and plenty of visits to others like ORD, ATL, LAX, DTW, IAD, etc where clearances involving the words "behind" and "follow" are quite common. Behind Use of this word means that you are waiting for an aircraft to pass. You are giving right of way or yielding to the traffic in question. This clearance is often given when holding short of an intersection and waiting for perpendicular traffic to cross the intersection before you continue through it. Much like waiting at a stop sign in a car. You are not expected to follow the airplane in question and even if you are assigned a turn to taxi along the same route as the airplane, you have your own clearance and are not following that aircraft. "Continental 1234 taxi to runway 22R at W via K hold short of S", followed by "Continental 1234 you'll see a B767 passing right to left on S, behind him continue to runway 22R at W via K R hold short of W"
"Continental 1234 taxi to runway 22R at W via K hold short of S", followed by "Continental 1234 you'll see a Citation from the right at S, behind him taxi via S W hold short of R.
In this case, you are waiting for traffic from the right again, but this time you are turning left after it passes. You will be taxiing behind it, but you are not following it. The Citation has a clearance to taxi S, cross runway 29, to parking. Your clearance is S turn right on W -- to follow the Citation would be wrong. Follow Use of this word means you are going to fall in behind this airplane and follow it wherever it goes. You clearance is no longer a specific taxi route, but simply to follow the airplane. "United 3412, hold short of J, let the EMB-145 get in line then follow him to runway 22R at W. Monitor tower passing L, you are number 29 for departure"
These clearances are used to get airplanes in line in a specific sequence and simplify giving repeated complex taxi instructions when you can just follow to conga line to the runway. The general rule is: "The pilot in command is ultimately responsible for the flight and its safety". So if the pilot decided it's better for him to use a certain taxiway due to weight/wingspan or he cannot land on a certain runway, he can make ATC aware and they will try to accommodate. Pilots are expected to follow instructions and clearances of air traffic control under normal operations, unless this would pose a threat to aircraft security or is simply not feasible. The ATC has the possibility to instruct an aircraft on ground to stop immediately or at the next intersection, etc. "DAL123, hold short of Alpha"
ATC has no way of forcing someone to return to the gate, if the pilot does not follow the instructions to return. They could even take off without clearance, but rest assured that they would be met upon arrival at their destination and an investigation opened into why they did not follow instructions. This is also true for using a wrong taxiway, the pilot will be asked to stop and rerouted via the correct taxiways. Mistakes happen, but when instructed to follow a certain set of taxiways, pilots must comply unless unable. It was my experience that the most direct route was understood between the controller and pilot. Consider the ramifications if this were not the case. If another route is needed, it is up to the PIC to inform the controller of that need. Also, if there is ANY question on either side about the instructions or requests, key up the mike and ask! Safe, Orderly, and Expeditious flow of air traffic. The pilot in command (PIC) always has the final say and decision making power. A pilot can reject ANY controller instruction. However, if a pilot rejects an instruction and it later turns out that it was done in a reckless manner or for a blatantly wrong reason the FAA will revoke the pilot's license. If a pilot rejects a controller instruction, it is the duty of the controller to react appropriately and make any necessary changes. Let's illustrate this with an extreme example: a Cherokee is in the pattern and has not yet been given a landing clearance. The controller tells the Cherokee "You are number 2 behind the Arrow" (which has been given a clearance). The Cherokee now says "Negative, I am landing right now on three four, number one" and he zooms in front of the Arrow, completely violating the controller instruction and landing without a clearance. What the controller will do is tell the Arrow N12345, "Arrow 345 abort landing, assume heading zero niner zero IMMEDIATELY!" If it later turns out that there was a fire on the Cherokee, then no action will be taken. If it turns out the pilot of the Cherokee was just trying to get to a business meeting on time, then his license will be revoked. As for the dispute between ground control and the pilot in question from LiveLeak, apparently the pilot thought the taxi route was poorly chosen or not correctly spoken. The article is incorrect in many of its details (you don't land on taxiways obviously!) What apparently happened is that the controller was planning to use Mike for a landing aircraft and directed the Delta pilot to use Lima--a longer route. The pilot probably thought the landing aircraft was far away and that he would be long gone before the other aircraft landed, so he thought the controller was being a jerkoff by making him take the long way around. In a situation like this courtesy dictates following ground control, but the pilot was within his rights to stay on Mike. I doubt the incident was reported, but if it had been the pilot would have been cleared in all likelihood, because all he would have to do is show that the landing aircraft arrived long after he was gone, thereby showing the controller to have had bad judgement. The pilot would only be penalized if his actions could be shown to compromise safety, which is not the case here, since in the worst case scenario the only outcome is that the landing aircraft might have to wait a little longer--not a safety issue. Just to clarify the "authority" question here with regards to the recording: if you listen you will hear the pilot order "Route on Mike". This basically means he is rejecting the Lima instruction of the controller and ordering him to re-route on Mike. No question who is in charge here. Not the answer you're looking for? Browse other questions tagged faa-regulations safety radio-communications taxiing or ask your own question. When can a pilot disobey ATC commands? Who has more power? Air Force One PIC or ICAO or FAA? How can an airliner make up for time lost? What to do if expediting your ascent or descent is impossible/unsafe? Was ATC overstepping its boundaries when advising a pilot to ignore a cell warning? Who decides how fast commercial aircraft fly: the pilots or ATC? Who has right of way on the ground?